This year is First Avenue's 40th Anniversary & we've got quite the year planned to celebrate. 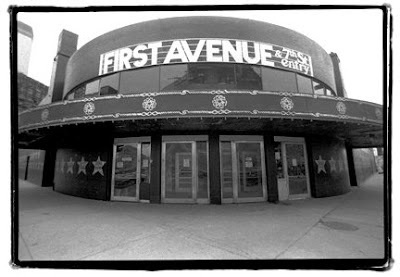 To kick it all off we're holding a Facebook contest where we want YOU to share your fondest memory of First Avenue. Just post it right here on our wall and you may win a pair of passes for a year at First Avenue! Take a minut...e, reflect and post a poem, essay, photo, rant, etc. to share your favorite memory of First Avenue. Jenny Szymanski Ah spending many many nights dancing salsa with Latin men almost 10 years ago..My 21st birthday evening ended there with my free bottle of champagne and my bottom on the floor. Mid ‘80s, seeing who-knows-what band, standing at the bar on second floor. I turn around and see I’m standing right next to Prince, dressed in an aquamarine satin jump suit and stiletto-heeled boots. Those were the days. My fondest memory at First Ave is when I brought my wife there on our first date to see Interpol back in 2003. I know that she was a keeper, because she wouldn't let me spend any of my money and she bought me large Beck's Dark all night. Of course my memory happened more than once, falling down the stairs! Dan Endy The Ramones...early 80s with my college roommate Joe, and his soon-to-be ex-girlfriend, Pam. Incredible energy + massive sound + a small venue = boatloads of sweat. My head wasn’t right for a week. Did you submit your story yet?